Hospitals have a hard time meeting the CMS' sepsis treatment requirements. The national average compliance rate for the Severe Sepsis and Septic Shock Early Management Bundle is barely 50%, according to the most recent data on Hospital Compare. The measure was adopted in July 2015 to improve hospitals' identification and treatment of the life-threatening condition. More than 200,000 people die each year from sepsis. WellSpan Health, an integrated delivery system based in York, Pa., has blown past that average, recently boasting an 85% compliance rate for the bundle. WellSpan executives credit a year-old quality improvement initiative that involves leveraging the electronic health record and a remote patient monitoring team to identify and treat patients with sepsis early. Create an algorithm in the electronic health record that identifies patients at risk for sepsis. Establish a remote team of nurses who monitor sepsis alerts and communicate with bedside clinicians. Enable nurses to continuously monitor patients to ensure all steps of sepsis treatment are followed in a timely manner. The initiative launched in May 2017 after WellSpan began its transition to an Epic EHR system. 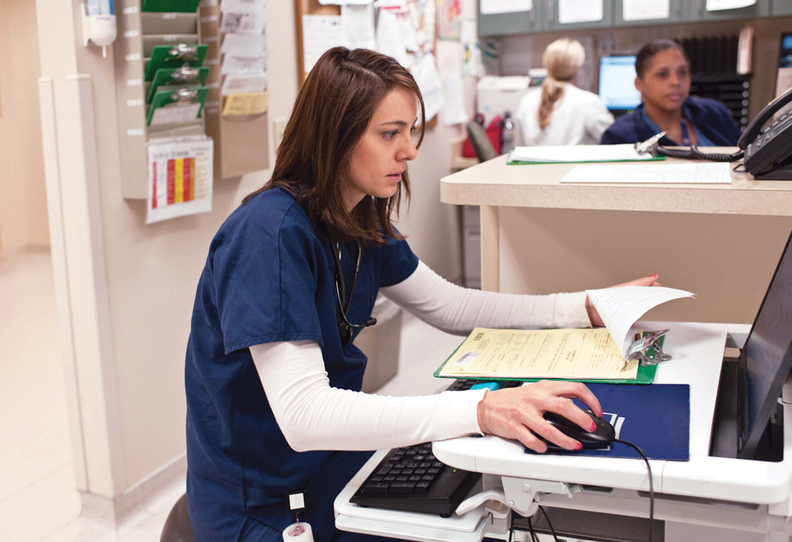 “We knew we had new tools by having a common EHR, (so we started to brainstorm) how we take these tools and leverage the workforce to deliver better care and improve outcomes,” said Dr. Steven Delaveris, vice president of medical services at WellSpan. Delaveris, along with Jodi Cichetti, senior director of quality and clinical improvement, created an algorithm in the EHR that alerts clinicians to patients at risk for sepsis. The algorithm evaluates a patient's vital signs including their temperature, heart rate and lab results. But WellSpan executives were also keenly aware that clinicians are already inundated with lots of alerts and alarms. To address alert fatigue, WellSpan established a remote surveillance team to monitor sepsis alerts and patients' vital signs 24/7. The Central Alert Team operates much like air traffic controllers do, with the nurses monitoring patients at five hospitals, allowing them to review and intervene when necessary. Alerts go to the Clinical Alert Team rather than nurses at the bedside. Using patient record data on hand, nurses on the alert team will determine if an alert should be elevated to the next level. If so, they contact the patient's physician or nurse directly to let them know the sepsis bundle should be activated. Because the nurses only reach out to the bedside team when they see something amiss, the clinicians take their alerts seriously, Delaveris said. WellSpan also introduced the nurses to the clinicians they'd be working with so “it's not just someone calling from the sky. We wanted to build a relationship and trust,” he added. The nurses also continuously monitor the patients they see as at risk for sepsis to ensure the clinical team is following all of the bundle's steps. WellSpan opted to use the bundle from the Surviving Sepsis Campaign, which is closely aligned with the CMS requirements. The bundle has multiple steps that need to be accomplished within designated time periods. Before this year, the bundle required hospitals to check patients' lactate levels, obtain blood cultures and administer antibiotics within a three-hour time frame. And then within six hours, reassess if the patient requires more fluids and check lactate levels again. The Surviving Sepsis Campaign now requires hospitals to complete all those steps within one hour. The CMS hasn't yet changed its bundle to match those new guidelines, but WellSpan has rolled it out in its EDs. “There is continuous monitoring for each element of the treatment that needs to be provided for the patient because timing is extremely critical,” Cichetti said. During the 12 months after the Central Alert Team was established, about 11,520 patients were monitored. The average sepsis treatment bundle compliance rate improved to 85% in May 2018 from 34% in July 2016. Additionally, mortality rates for sepsis decreased across all the system's hospitals. At WellSpan Gettysburg Hospital, the mortality rate was 3.48% for the first 10 months of 2018, lower than the 5.2% baseline rate for 2017.